I was coming home From Target tonight when I saw that the former Quizno’s shop will soon be a Five Guys! I love their fries, they have good burgers too but I think their fries really are the star of the show. I took this picture at their Marlborough location. I couldn’t find an opeing date for the Framingham location on their website but it will be at the “food mall” at Rt. 30 and Caldor Rd. Can’t wait till they open! Wow! 5 Guys is trying to take over the world. They are popping up fast all over the place. It seems kind of silly to me to open this one up in Framingham though as they just opened (or perhaps are about to open I don’t know) one in Natick by the Building 19 at the corner of Rt9 and Rt27. You nailed it on the head: merely good burgers, exceptional fries. I wonder if there’ll be a Krispy Kremesque honeymoon-over dropoff after a while, because while Five Guys offers superior quality to the fast food Big 3, their pricing is closer to pub level, without the pub burger quality. Yes!!! My first Five Guys experience was a few years ago in DC. I would describe their burgers as a little better than “merely good.” They’re not great, but somewhere in-between. I’d take a Red Robin burger over Five Guys any day. But those fries…yummmm! No sense ordering a large size, they give you more than enough with the small size! I hope this location is good for Five Guys, it sure wasn’t for Quizno’s, but then again, that particular Quizno’s charged more than other locations for every single menu item. No wonder it didn’t last. It’s interesting that both Framingham Quizno’s have now closed. So close to the Natick location! Yikes! Good fries and decent burgers….lookin’ forward to it! While I agree that opening one so close to one another seems silly, lets rememebr that these are owned and operated independently, so it’s not as if Five Guys are the silly ones here. I am more concerned about the constans problems in that “mall” with rodents in nearly every place to eat there. Would hate to have that tarnish Five Guys, but the building is swimming with rats, as outlined in the MetroWest Daily news recently. Just found out Hometown closed around March. The owner who bought from the original was creepy and the food went down hill. Have not tried the new place. I also heard Naked Fish is closing end of June. Good luck to this place. The price point needs to be under $10. Good location but sandwiched between MCD’s and BK ouch. Any news about the place next to the rte 30 post office opening? I am one of many who will not miss Quizno’s. That location did not honor coupons and advertised specials. Needless to say I never went back. Not surprised to see them go. Quizno’s is the worst chain going. I can’t wait for the one in Marlborough to close down. I brought it in a coupon for BOGO free once and the owner told me they wouldn’t take it. It was a coupon out of the Sunday paper, not some random shady coupon I found. Never been back. I lost any interest in trying Five Guys (which just opened near me in Natick) when I found out they won’t cook burgers any way but well done (ick!). For a place that specializes in real burgers (not fast-food patties), this is inexcusable. Naked Fish will reopen under a diff name and concept. Five Guys is good. Dont see this location benefiting anyone except the person the has the development rights. At this point, Casey’s ranks as the best burger in MW. Unfortunately they have no fries. 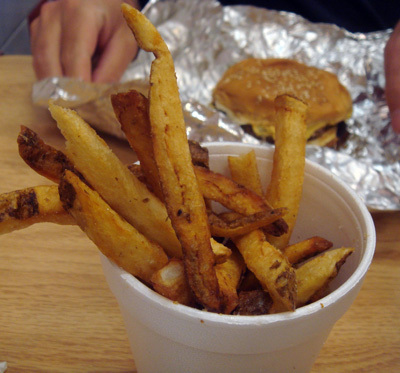 Fiveguys has fries but no rings. You want another good burger place? UBruger in Kenmore Sq. great burgers, the fries are much better than Five Guys, and they have onion rings. I heard that the Naked Fish will be a mexican restaurant. Framingham needs a decent mexican resturant but I am not holding my breath. I will miss Naked Fish though and their coconut haddock. 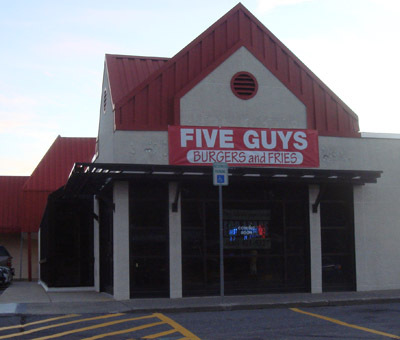 I ate at the Five Guys Burgers on Route 20 in Marlborough a few months ago, and would NOT go back. The burgers were gray, overcooked, and tasteless. The fries were fresh but VERY greasy. Finally opened this past Monday (Nov.8)!!! also if you were luck enough to go there Saturday they let you eat for free you just had to “tolerate” was the waitstaff as they were still in training. Sorry East Coasters but In ‘N Out still rules the west even though a bunch of Five Guys are here! I just ate at one for the first time in Sacramento. Those Cajun fries are wicked good! Hey Hey! Five Guys is coming… as stated earlier they are decent burgers and good fries… just good to have a juicy and affordable burger place on the strip… no “Where’s The Beef?” here! I think Route 9 is so heavily populated these guys won’t lose out at lunch time, despite Natick being so close. It’s not like they are opening up a Five Guys in Upton and Grafton at the same time!